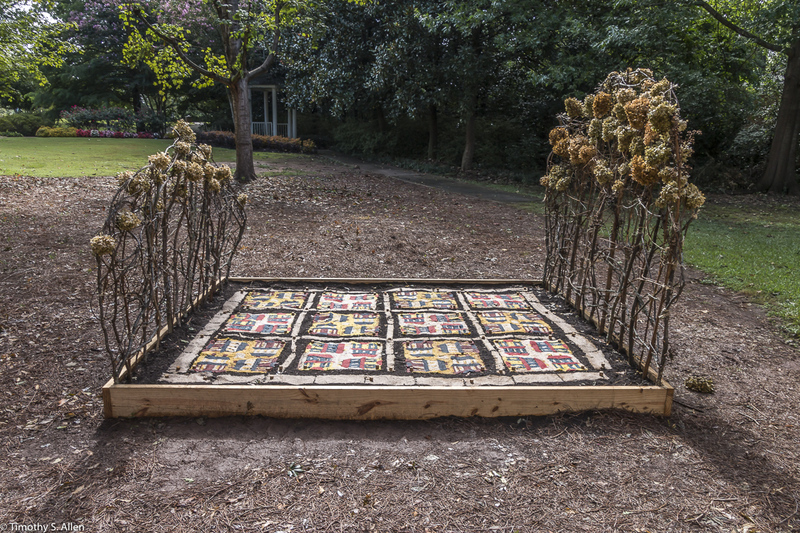 Jane Ingram Allen is one of 16 artists invited to exhibit in the exhibition “In Our Nature” curated by Meridith McNeal at the Corridor Gallery of the Rush Philanthropic Arts Foundation located at 334 Grand Avenue, Brooklyn, NY. 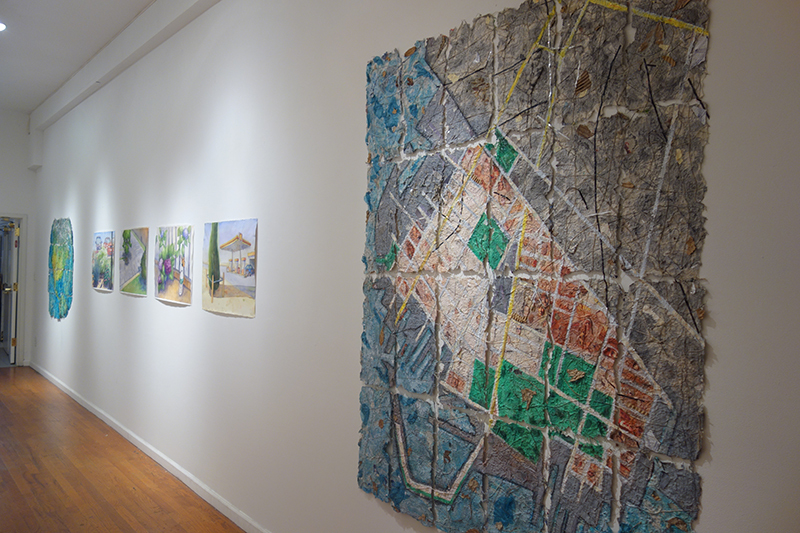 The exhibition opened on September 10, 2017, and continues through November 19, 2017. 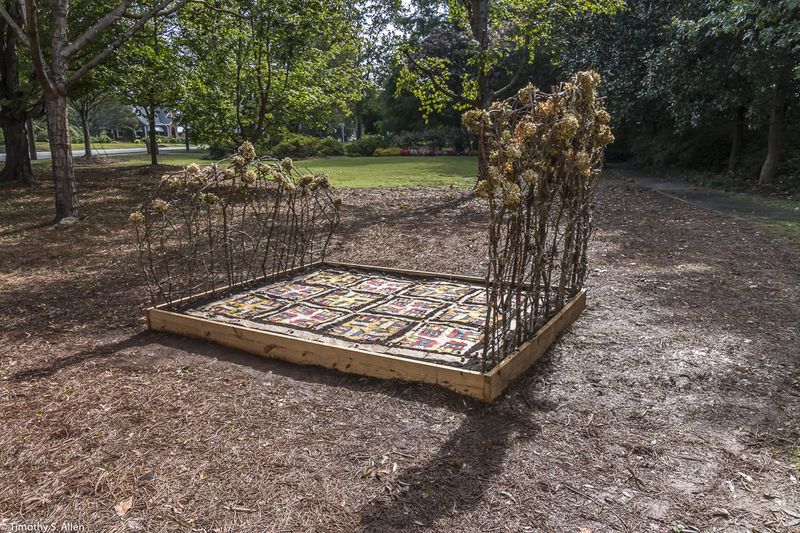 The exhibition features art focused on nature and the state of our environment. 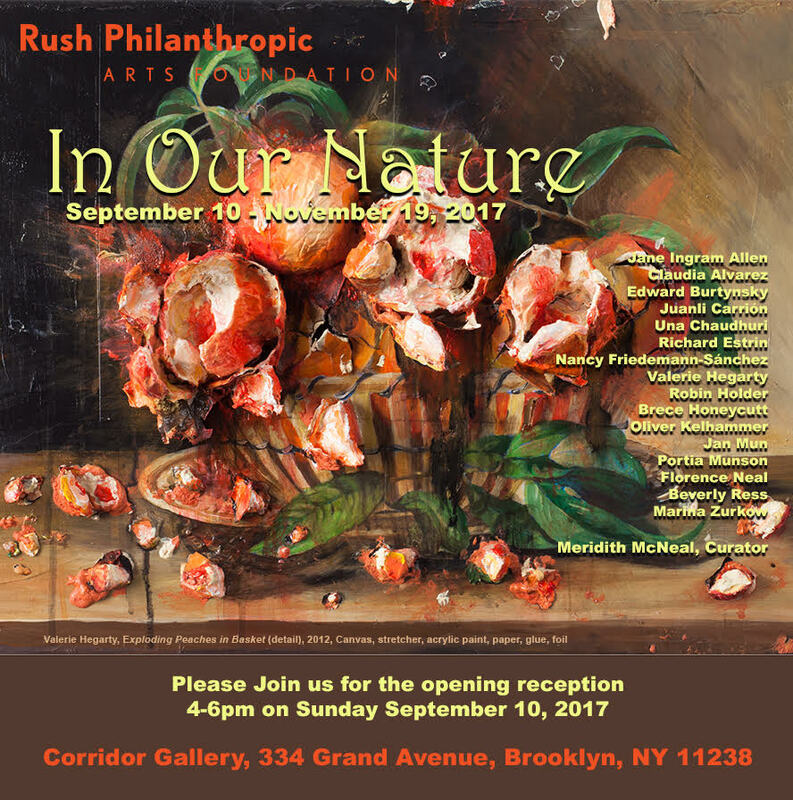 See the website at http://rushphilanthropic.org/exhibition/in-our-nature/ for more information about gallery hours and location. 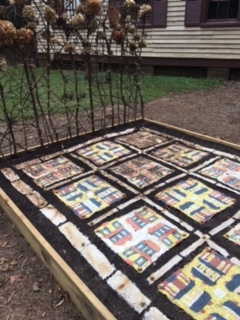 My artist-in-residency project at Newnan Art Rez (www.newnanartist.org) in Newnan, Georgia, “Living Quilt for Newnan”, was installed on August 31, 2017. 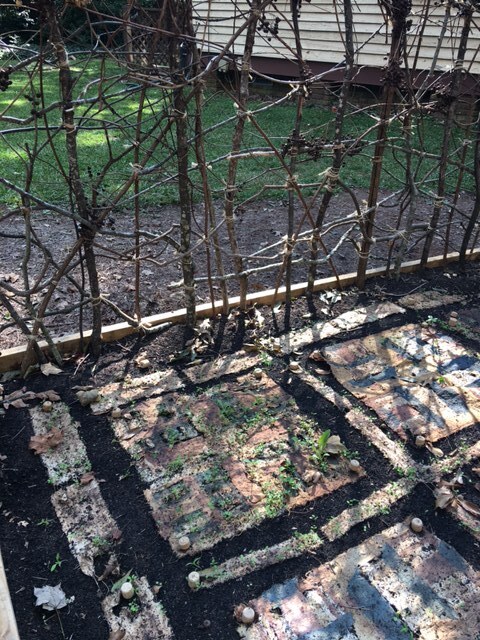 Just a few days after the installation Hurricane Irma arrived. 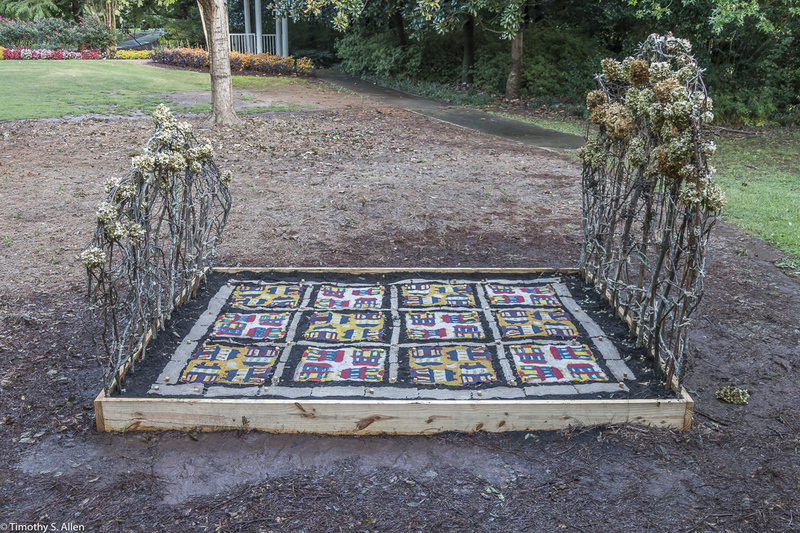 The art installation survived this latest hurricane to strike Florida and the southeastern coast of the US. 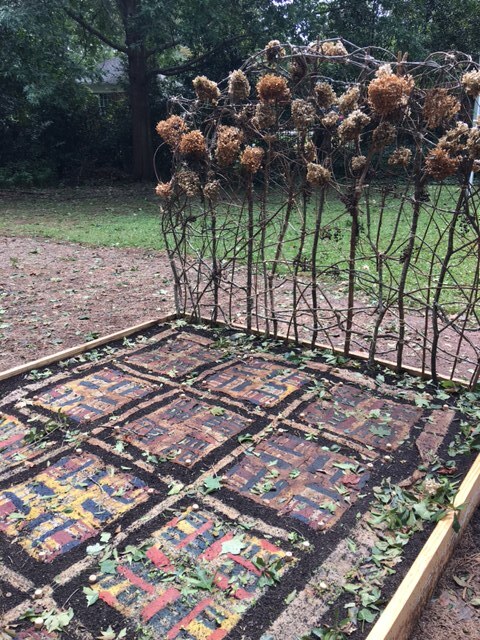 My “Living Quilt for Newnan” installation consists of a handmade paper quilt in a house pattern with seeds for wildflowers in the pulp to transform over time into a living blooming work of art. 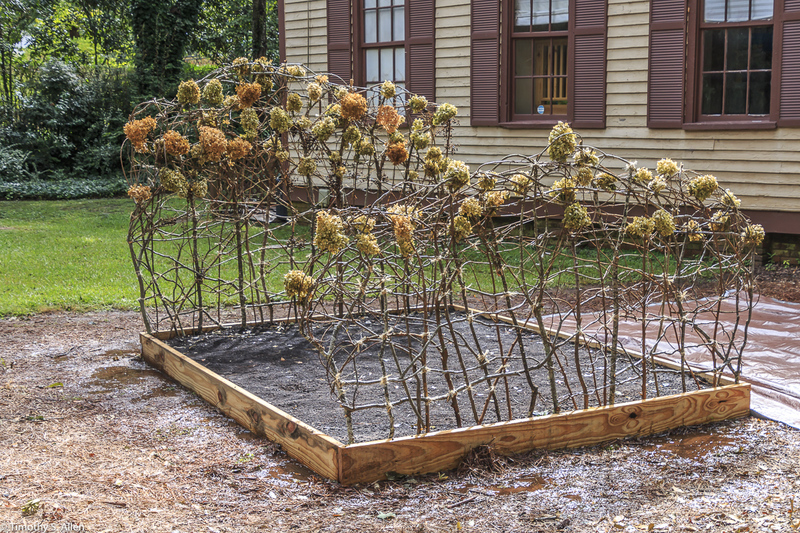 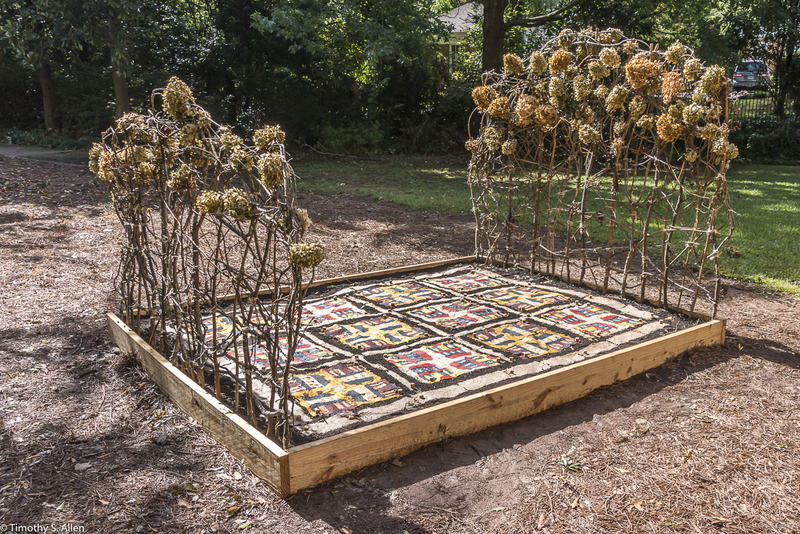 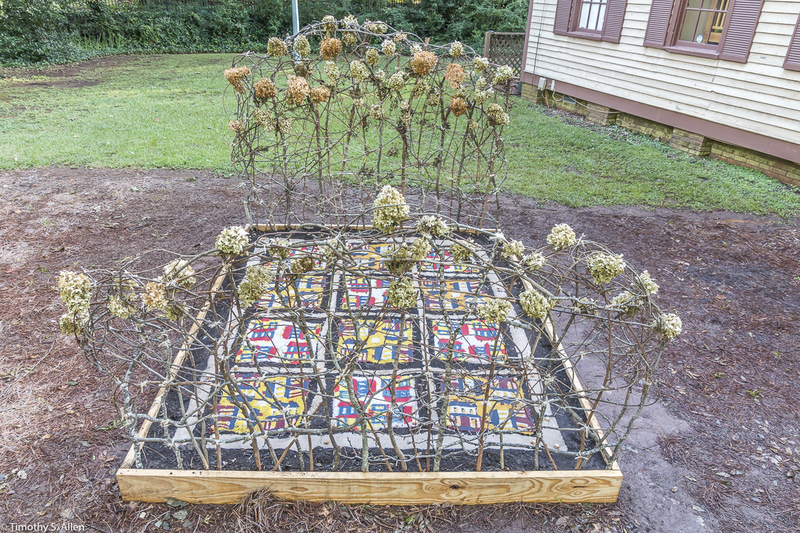 The quilt is installed on a “flower bed” of soil with a headboard and footboard I made with local branches and vines. 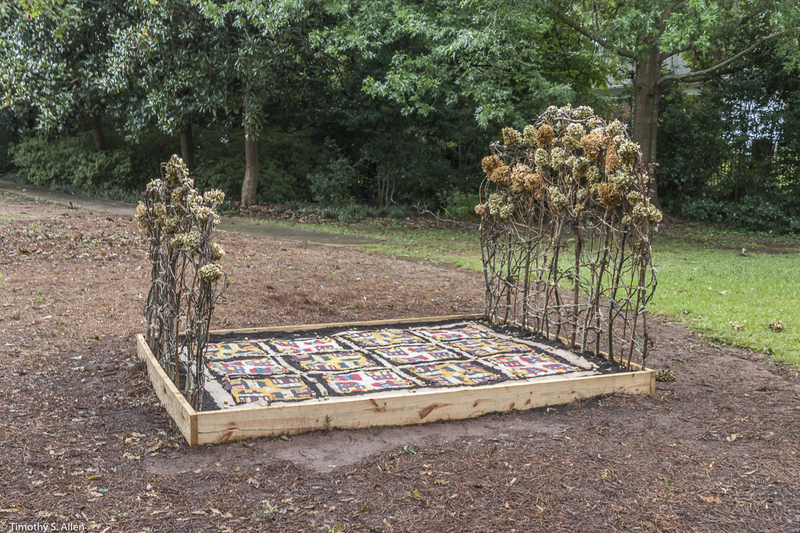 The installation seems to have survived well the heavy rain and winds in the Newnan area. 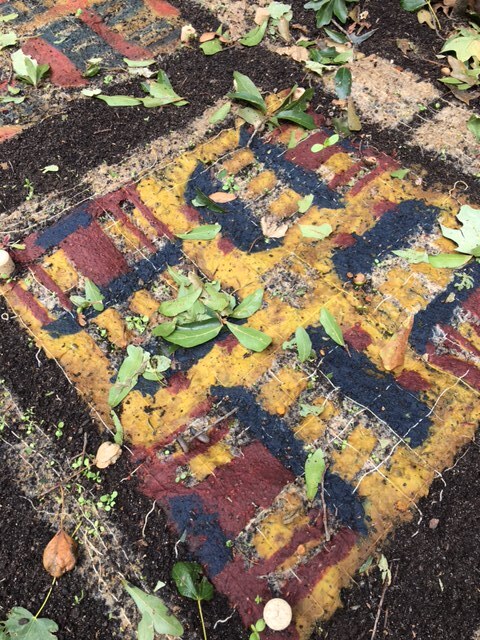 There were some power outages in the area that lasted a few days. 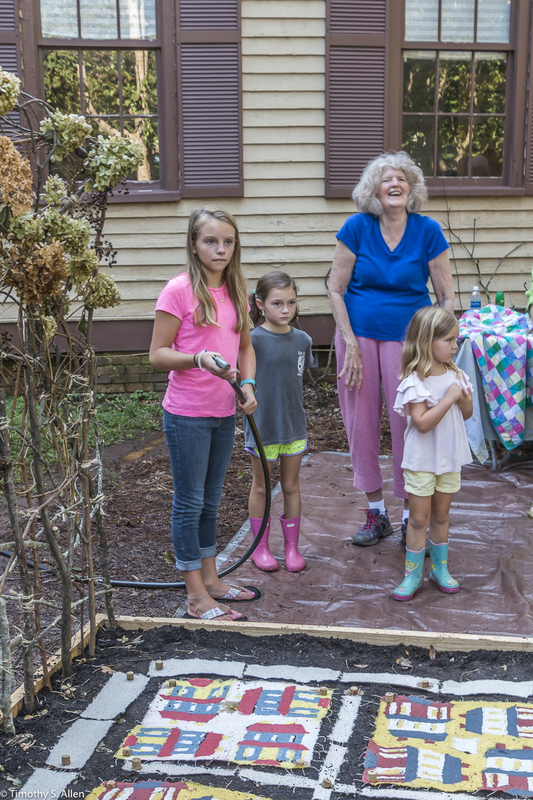 We wish all the people in the areas hit by the two recent US hurricanes all the best. 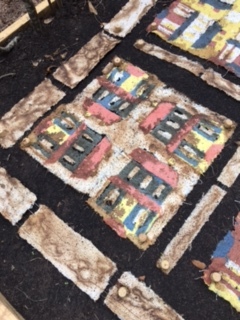 Here are some photos of the art installation in Newnan taken a few days after the installation and before the hurricane showing the transformation beginning and plants starting to appear as the handmade paper dissolves. 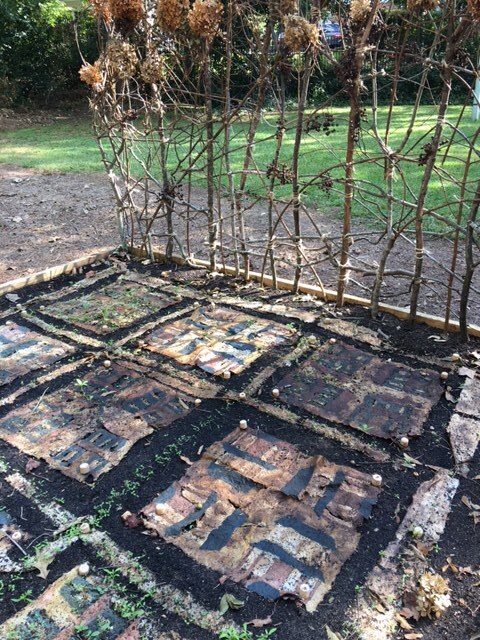 The last group of photos are showing the installation after Hurricane Irma came through last week. 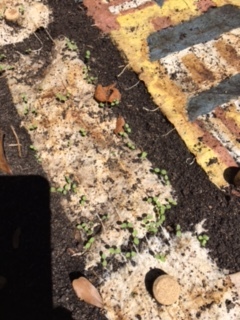 You can see the plants are growing bigger, and there are lots of loose twigs and leaves on the ground from the storm. 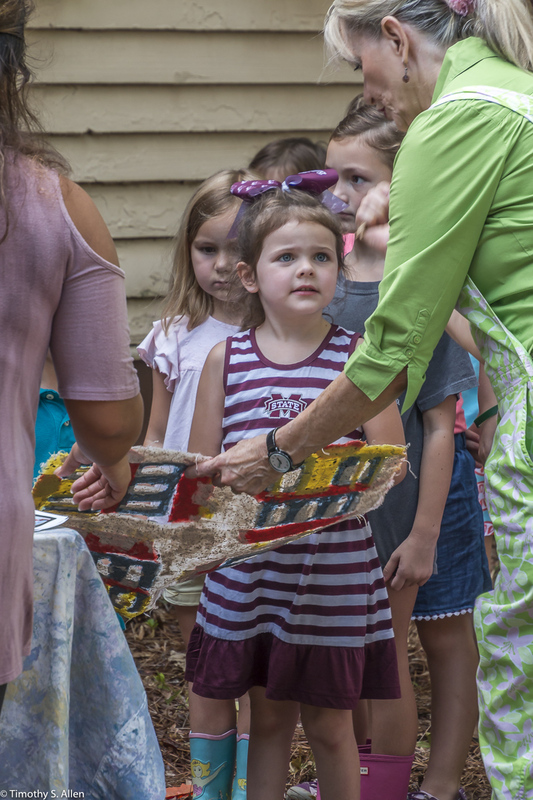 These two sets of photos are by artist and Newnan Art Rez board member, Bette Hickman. 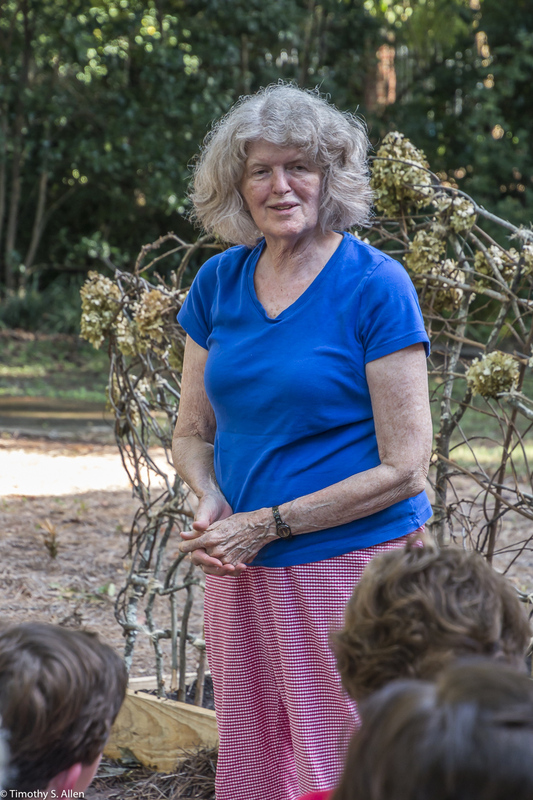 Thank you, Bette! 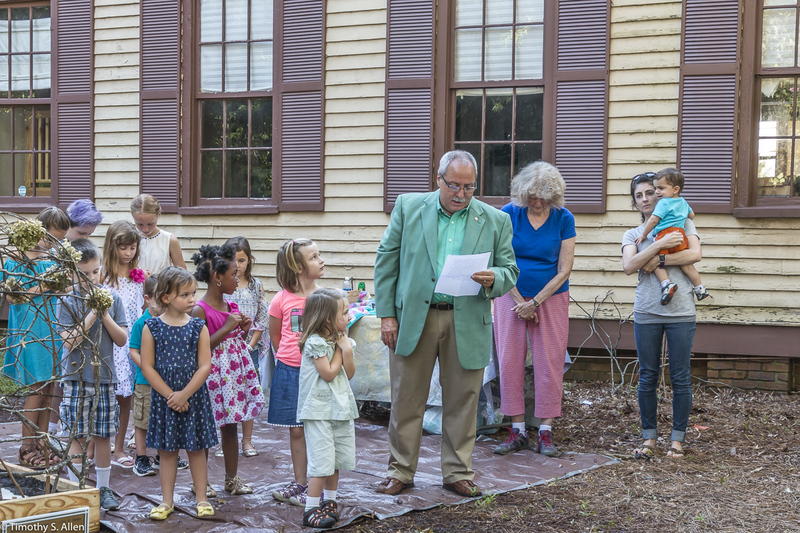 I will continue to post photos on this Blog when I receive them from the people in Newnan. 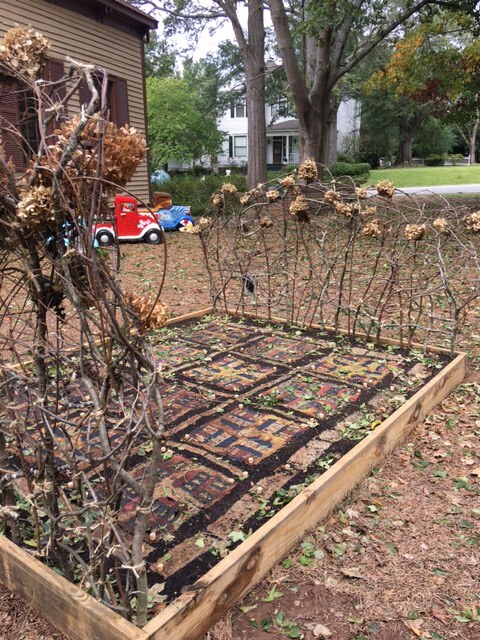 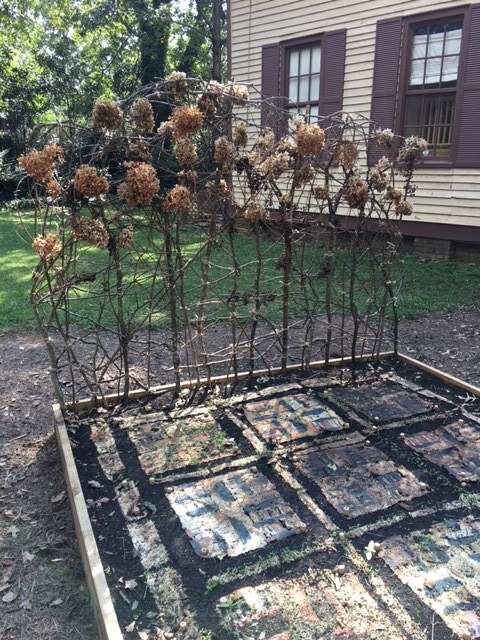 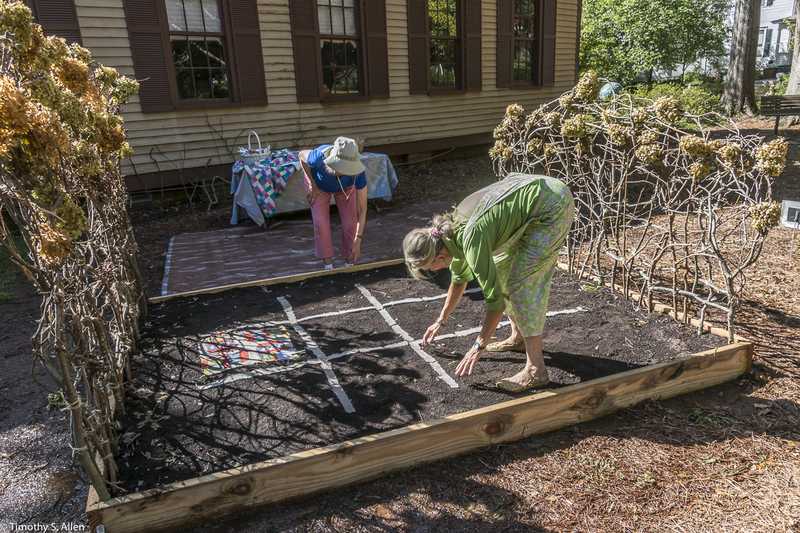 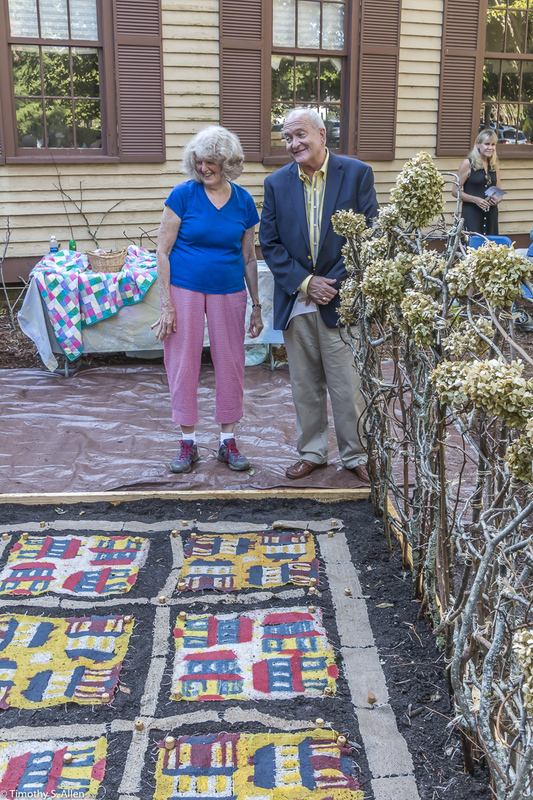 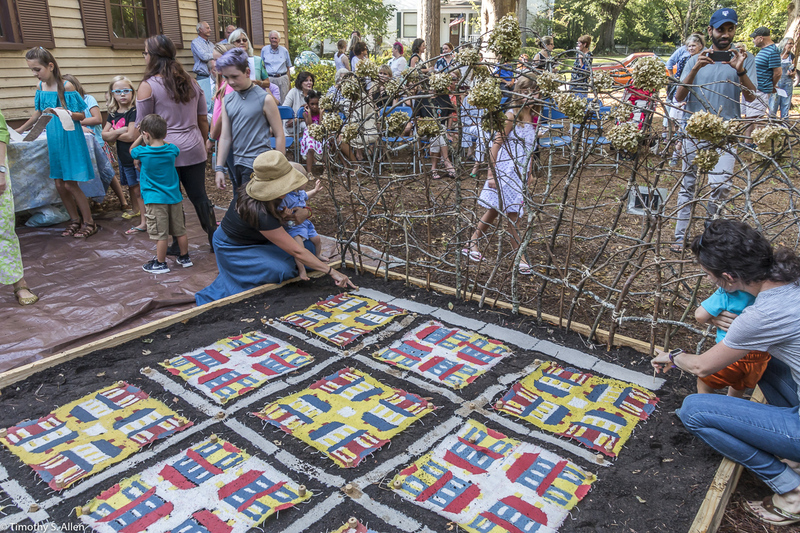 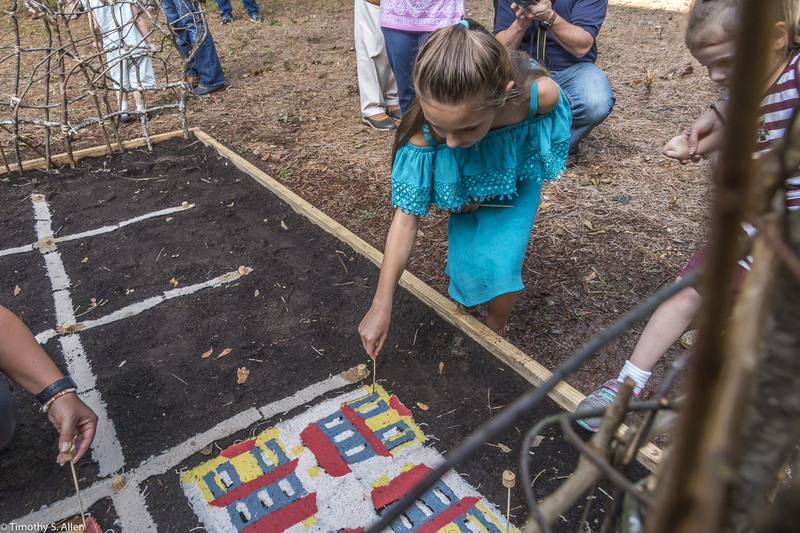 Hope the “living quilt” will grow well and provide lots of flowers for people in Newnan to enjoy. 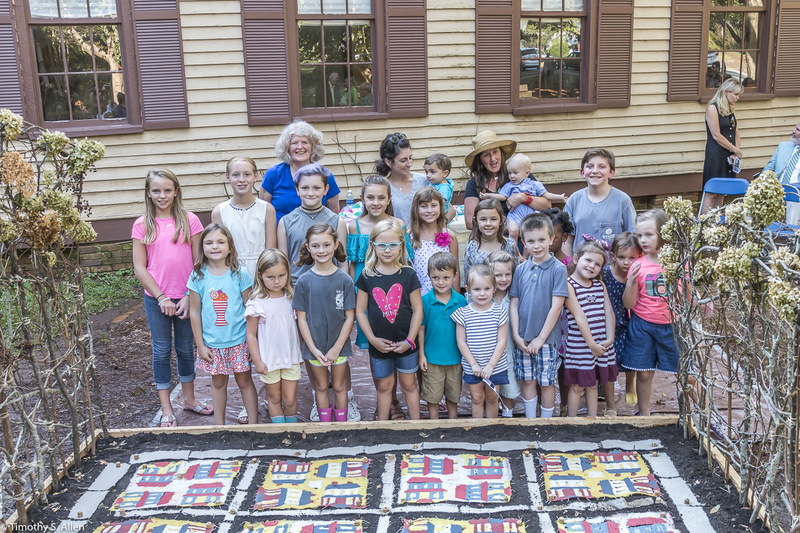 Newnan Living Quilt is Installed! 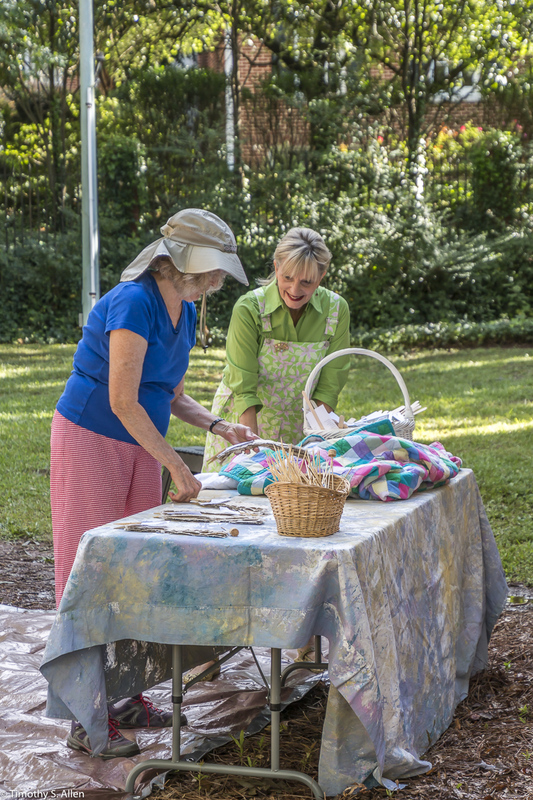 Just before the installation of the quilt squares – it was sunny! 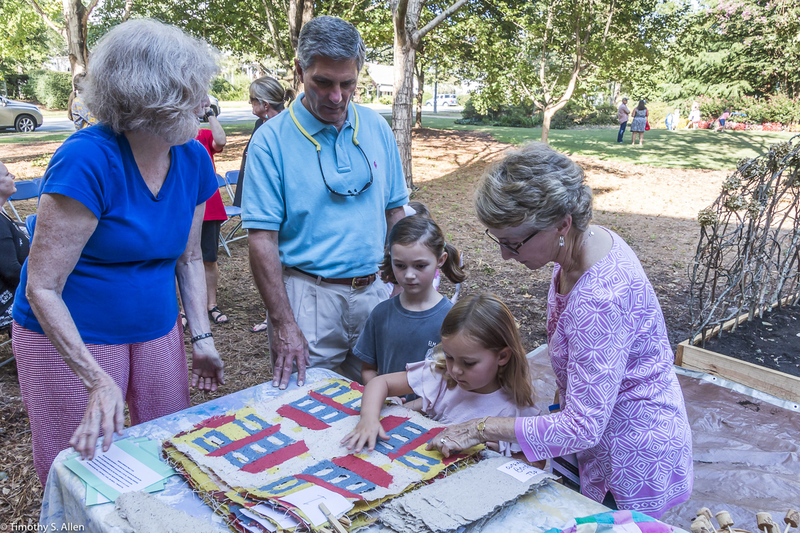 My “Living Quilt for Newnan – City of Homes” was installed at 6 PM on Thursday, August 31, 2017. 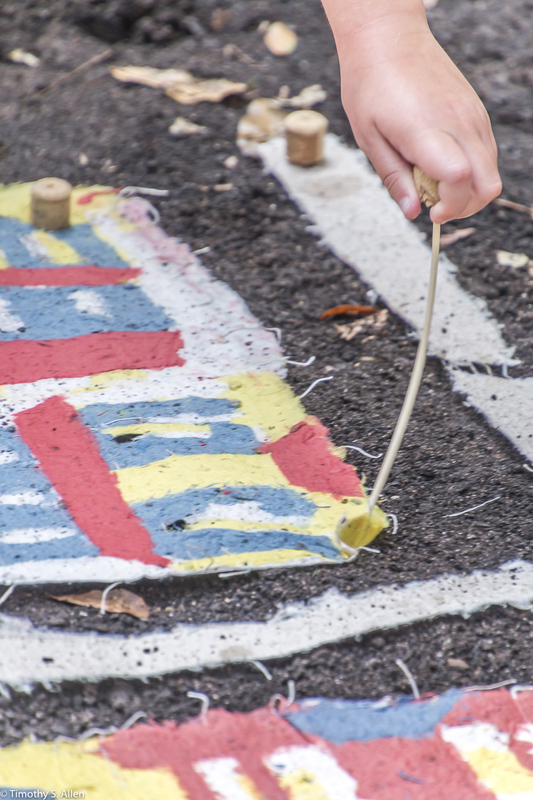 The weather turned out perfect with even some sunshine after a morning and evening before of heavy rains. 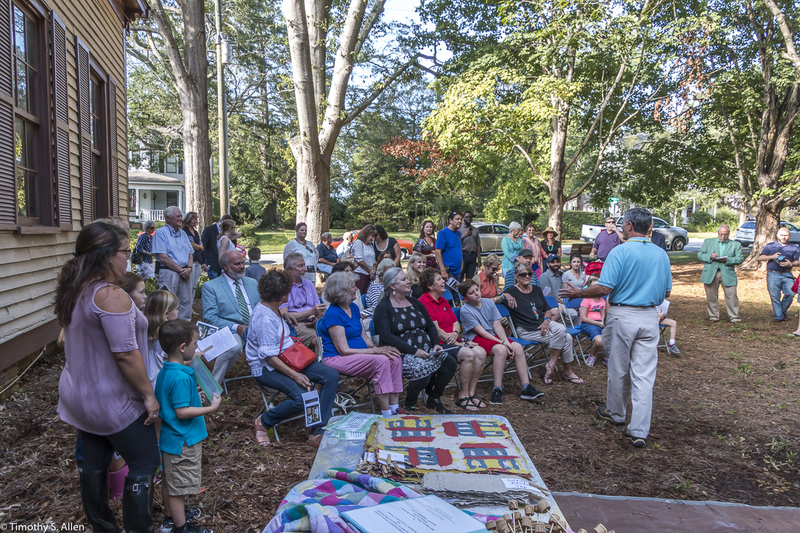 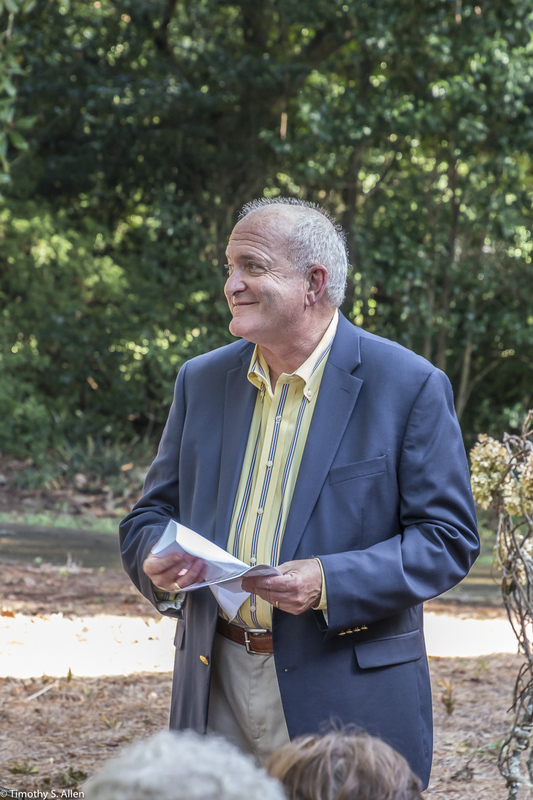 Many people came out to enjoy the installation and dedication ceremony including the mayor of Newnan and Art Rez Board Members and many local children who helped to install the handmade paper quilt squares. 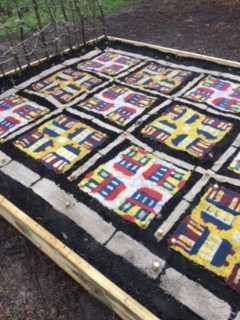 We staked down the quilt with bamboo skewers with a cork on top, all being biodegradable materials. 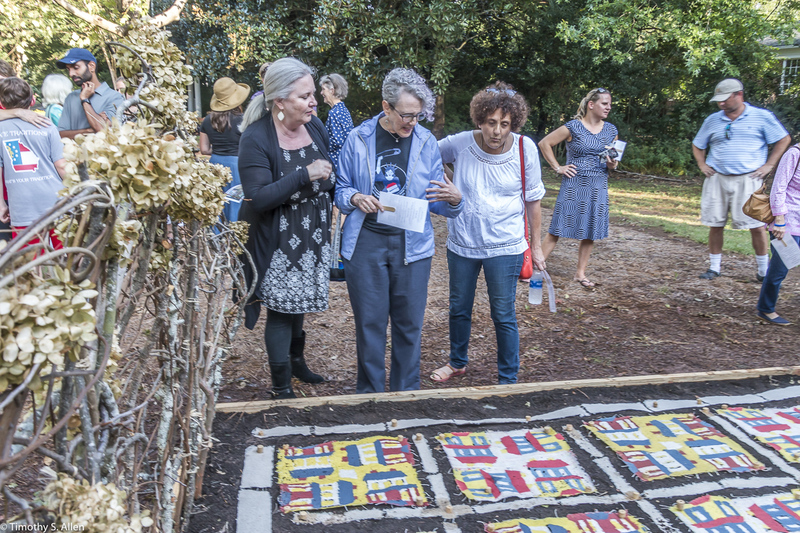 The quilt is made with hand papermaking using stencils and dyed pulp from purchased and local plant materials and has seeds in the paper pulp for Southeastern wildflowers in the same colors as the quilt pattern. 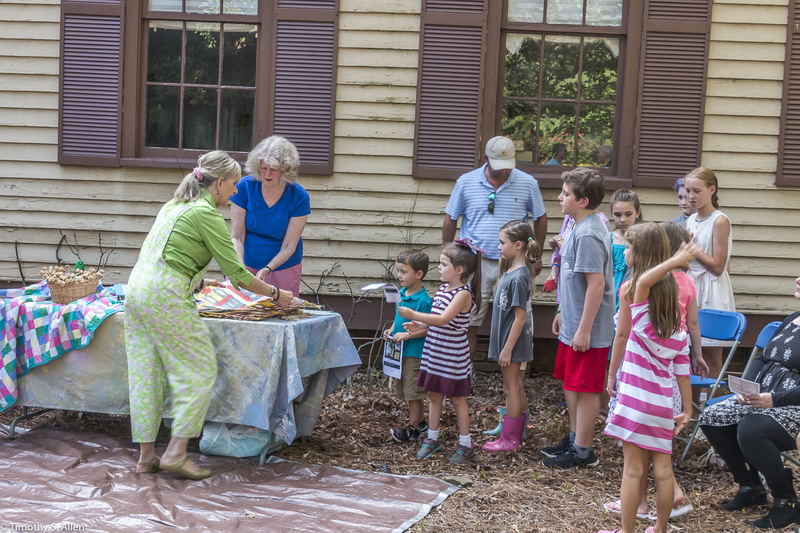 I used bark from cedar, crepe myrtle, magnolia, mulberry, paper bush and wisteria to make paper in Newnan and created a recipe and sample book for Newnan papermaking plants. 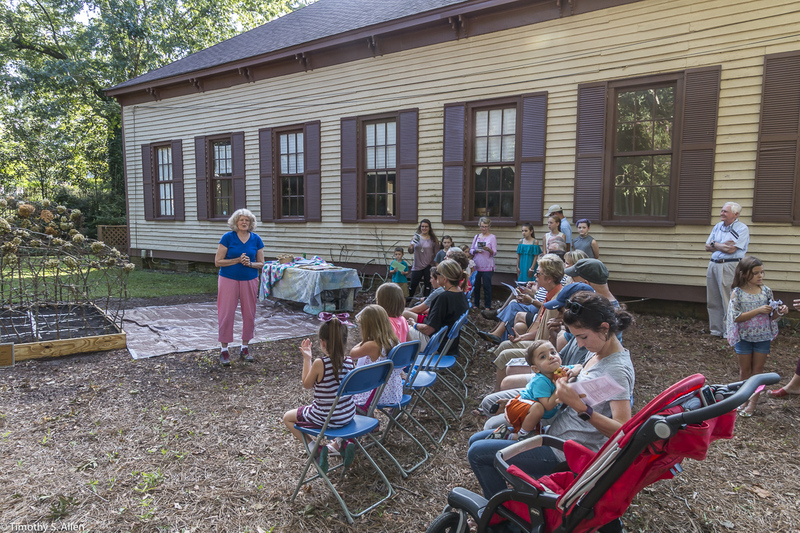 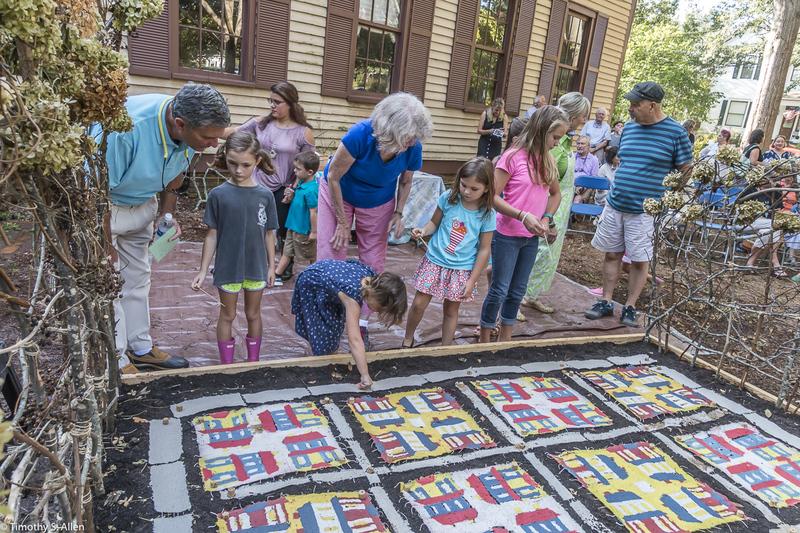 The Newnan Living Quilt has a house motif and features a 2-story antebellum home in red, yellow, blue and white colors. 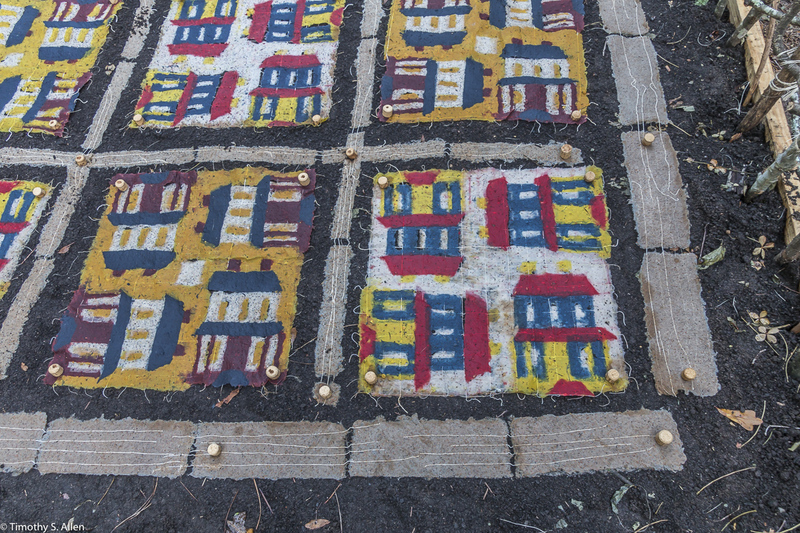 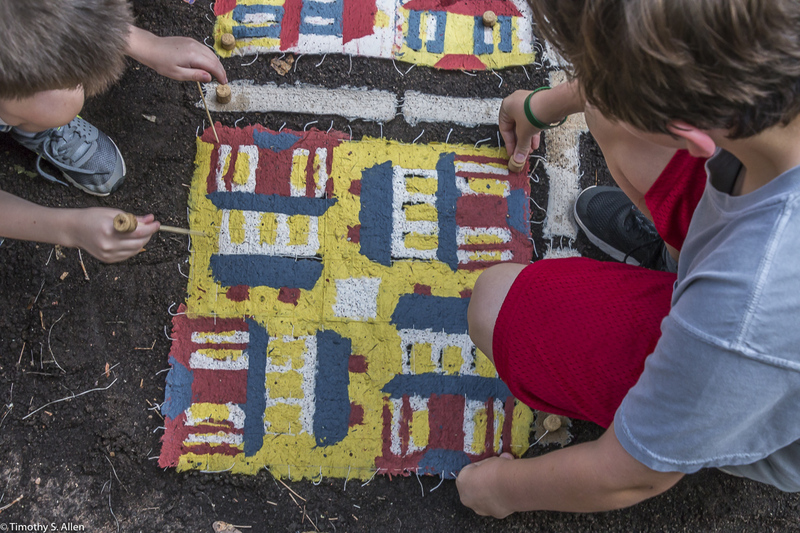 The homes are around a square in the middle of each 20-inch quilt square, and each home is composed of 8 layers of handmade paper with natural string in between layers helping to hold it all together. 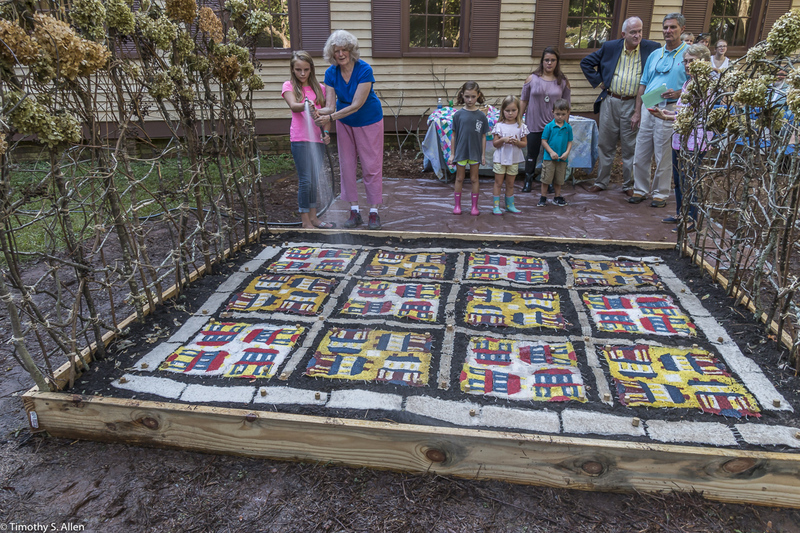 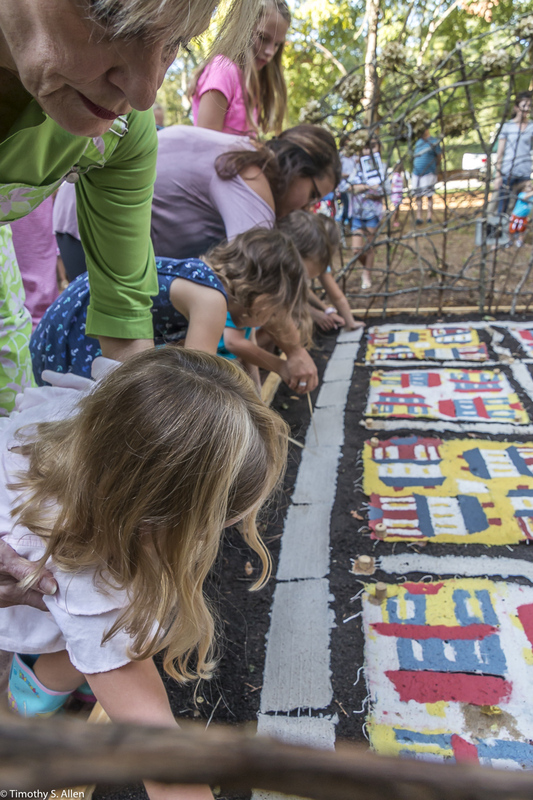 At the August 31 ceremony, local children laid out the squares and put in the stakes, and then a local minister/poet offered a prayer/blessing for the quilt. 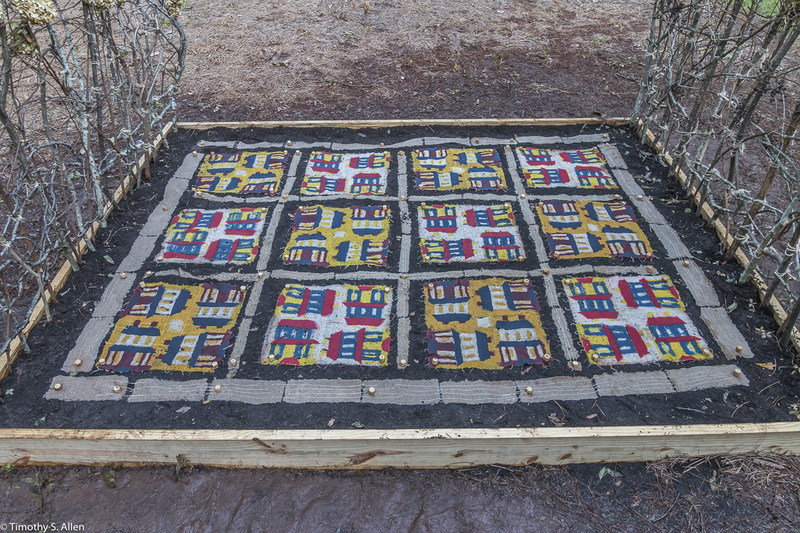 I am very grateful to all the volunteers who helped make the handmade paper quilt and construct the “bed. 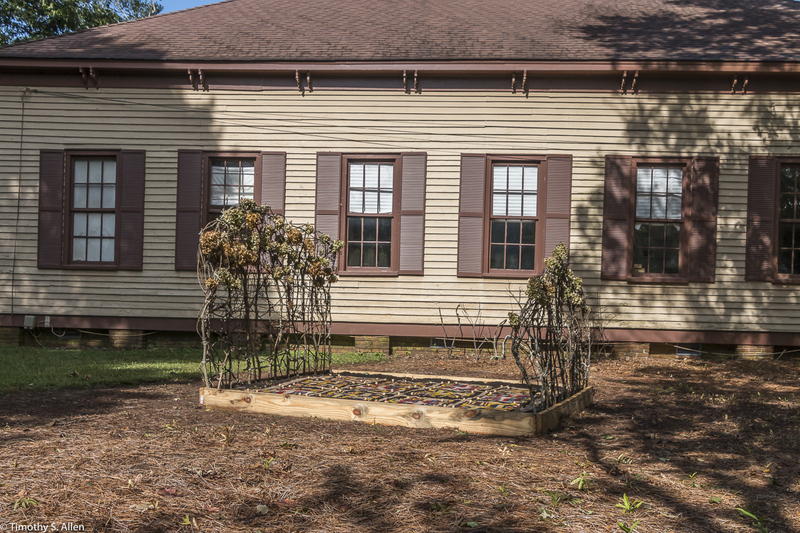 The headboard and footboard are made with local branches collected along the streets of Newnan after people had done some tree trimming. 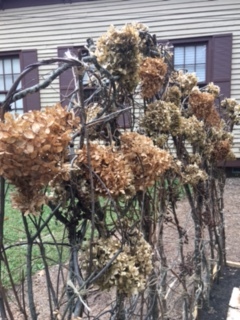 The headboard and footboard also contain wisteria and other vines and lots of hydrangea blossoms that someone had recently clipped off and left to be picked up. 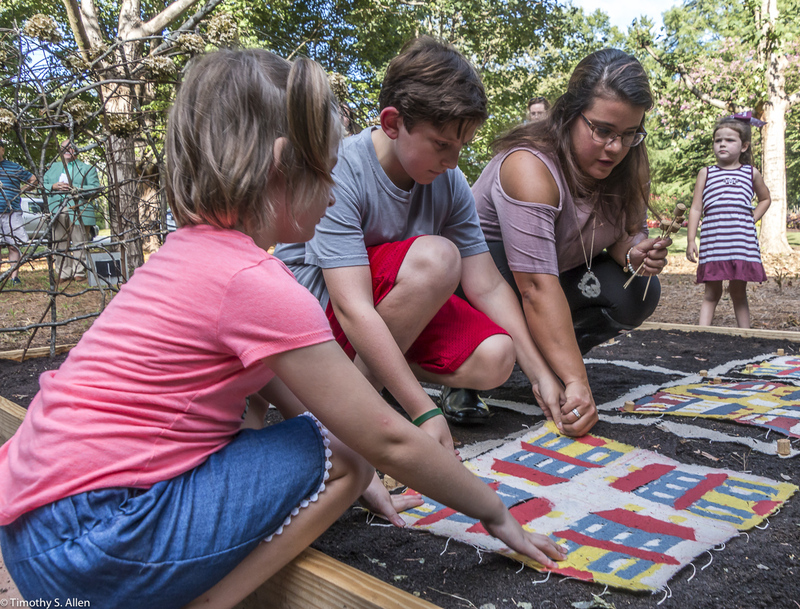 I was an artist in residence at Newnan Art Rez from August 8 to Sept. 1, 2017. 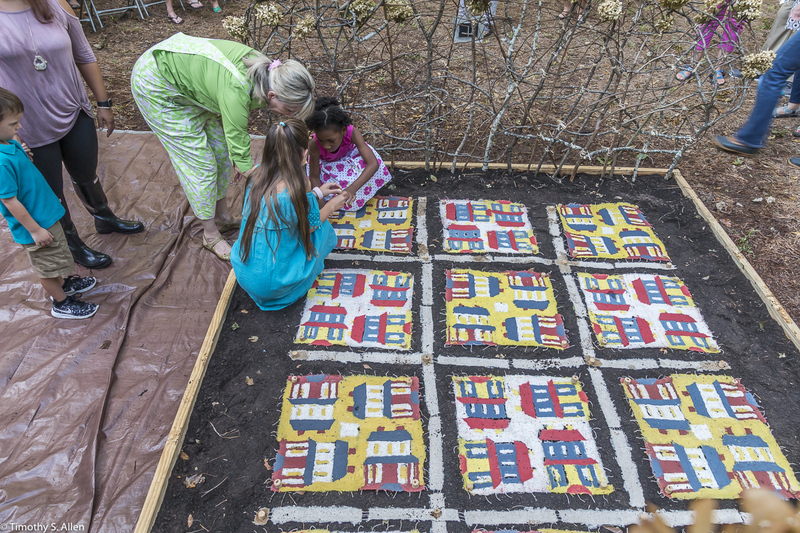 We leave Newnan today, and I hope the quilt will change over time with the seeds sprouting and blooming as a living quilt for Newnan. 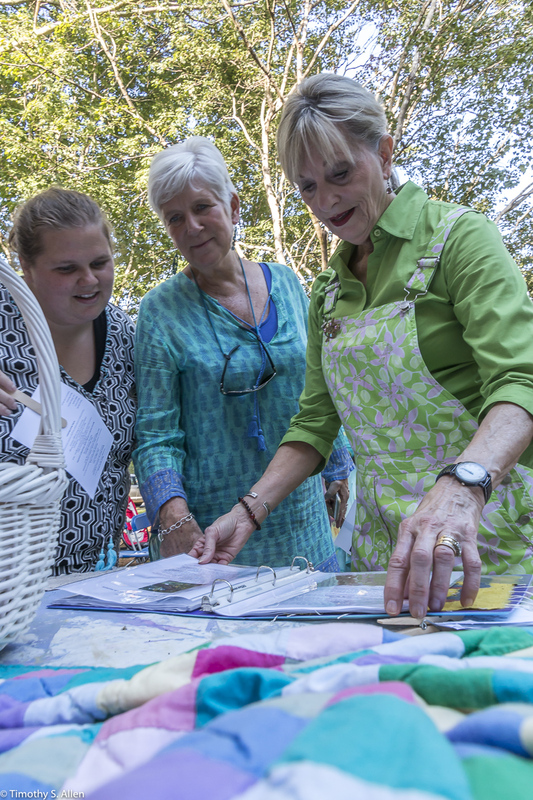 Check back here to see photos of the quilt as it changes over time. 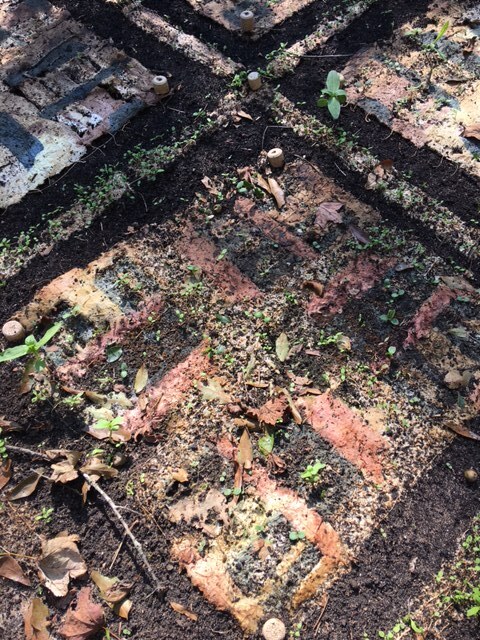 I am hoping that local volunteers will continue to send me photos. 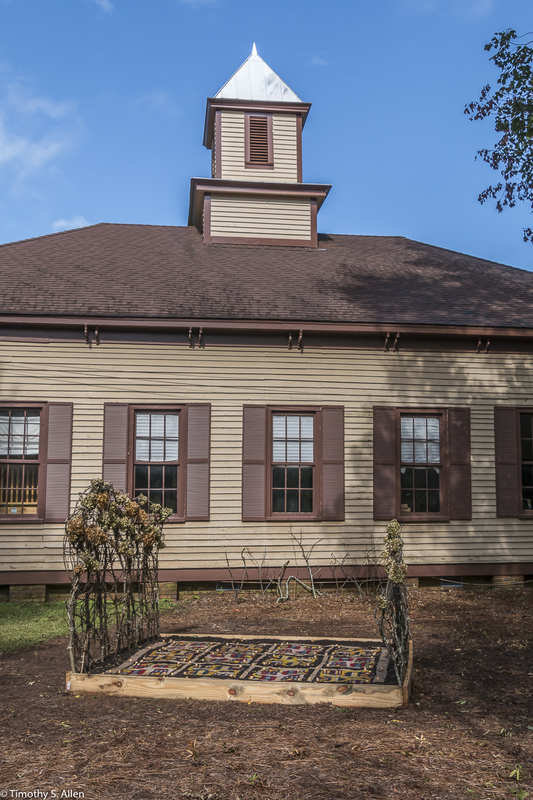 Thank you, Newnan, for a wonderful residency experience!